Yes, yes I did say that. And if you haven’t ever made a warm bacon vinaigrette and poured it over a salad that is packed full of other powerful and complementary flavors, you are missing out on an important thing in life. Warm bacon vinaigrette over a spinach salad should definitely be on your food bucket list. And you should cross that one off as soon as you possible can! Here’s an amazing salad for you to try and then you can cross that one off the list….because…bacon. Bacon. Bacon! Cook the bacon in a skillet, or in the oven. Reserve 3 Tbsp of the rendered fat. Let bacon cool slightly before crumbling. In a large mixing or serving bowl, toss together the spinach mix, pear slices, crumbled blue cheese, chopped walnuts and add the crumbled bacon to the salad once cooled slightly. Prepare the homemade bacon vinaigrette. In a small skillet or saucepan, add the bacon drippings and whisk in the sugar, spicy brown mustard and vinegar. Add a pinch of both salt and pepper. Once dressing has been well whisked, pour warm over the salad. 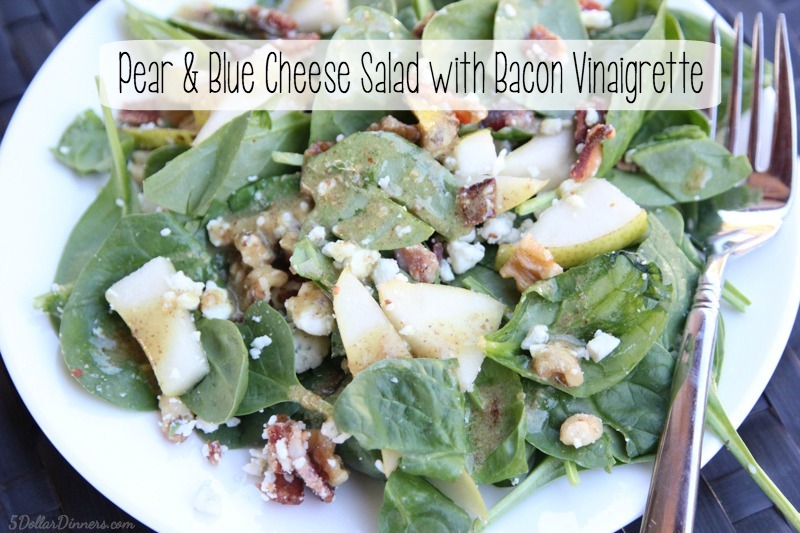 Serve Pear & Blue Cheese Salad with Warm Bacon Vinaigrette.